« Day 409 in Beijing: I Honestly Couldn’t Think Up A Title That Fit. 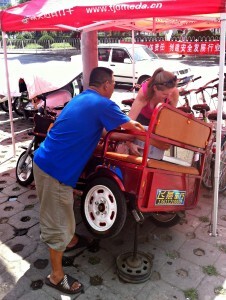 Day 410 in Beijing: Tuk Tuk Nyuk Nyuk. Lifting up the tuk tuk and Jill grabbing the microwave. It may seem as if Jill and I are constantly moving apartments but we aren’t. We just moved one time, to our new apartment near Sanlitun, and it just took numerous trips, at different times, with different people, to move everything. This was actually our final moving trip, as we gave the keys to the landlord and we got our deposit back, and we are finally done. The deposit issue, in China, is a whole different blog post and way too anger provoking to deal with on a happy and joyous blog. Therefore, I’ll stick to the funny stuff and the goofy things that happened to us on our last day moving. Well, we were driving our friend’s Tuk Tuk and we accidentally hit a metal barrier. Then again, who hits a metal barrier on purpose? No one so I’m just being redundant. Well, the tire seemed to have been cut by the edge of the metal and we decided we wanted to fix the Tuk Tuk and fix the tire as we don’t want to be jerks and abuse our friendship. So, we stopped by a local bike/scooter dealer and asked him to fix it. He hopped right on it, lifted the Tuk Tuk up with the most interesting jack I’ve seen in my lifetime, and fixed it very quickly. He laughed at what happened and seemed to have a great sense of humor which we appreciated. We ended up paying something like 10 USD for a new tire and the labor and hit the road. Luckily, our friend didn’t seem to care and laughed about it when we told him. In fact, he said the same thing had happened to him and it is to be expected driving around Beijing because it is so crazy.